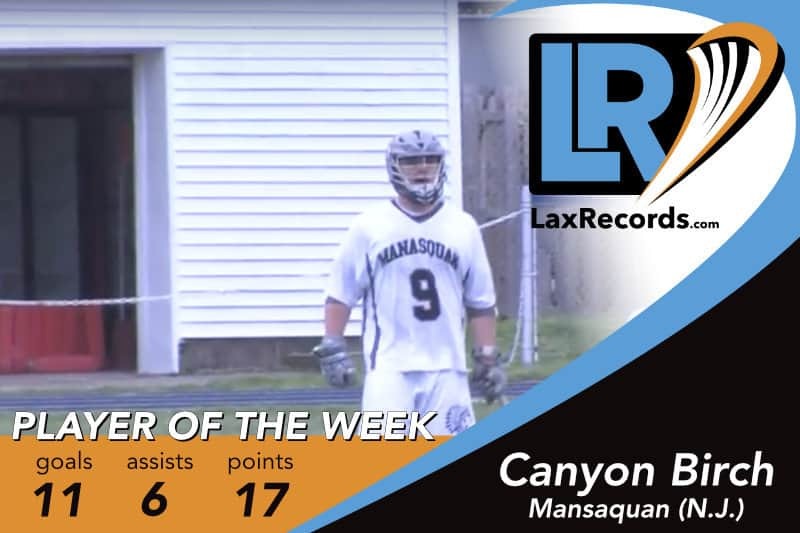 Canyon Birch from Manasquan (N.J.) is LaxRecords.com’s Player of the Week for May 28, 2018. Birch broke the best-known New Jersey record for the most points in a season after scoring 17 points in three games last week. Capping a stellar week, Birch scored 11 points on Saturday to put his season total to 174, breaking Teddy Hatfield’s (Morristown-Beard) record of 170 set in 2014. The attackman scored six goals and five assists in a 15-8 win over Madison in the South Jersey, Group 1 title game. As if the season total is not enough, Birch is just seven goals away from tying the state record for most goals in a season. Matt Poskay scored 129 and is the best-known record in the state. So far. Birch has at least one game left in this season, depending on how the Group 1 final against Mountain Lakes (N.J.) goes on Wednesday. The junior has seven games of at least 10 points this season, He opened the year with three-straight double-digit games. He has managed to score at least two points in every game this year. Birch has 353 points now, with 260 goals and 93 assists. Jack Traynor from Malvern Prep (Pa.). The senior scored four goals to lead Malvern Prep (Pa.) to the inaugural Inter-Ac playoff championship. The sophomore scored three goals, including the game-winner in overtime to give the Falcons their third-consecutive state championship and eighth in school history. Severna Park defeated Winston Churchill (Md.) 8-7 for the Class 4A title. McInnis scored four goals and dished out two assists to lead Bishop Guertin to a 13-7 win over Duxbury (Mass.) last week. The win moved the Cardinals to 17-0 on the season, with wins over teams from Washington, Massachusetts in addition to New Hampshire. Monitto scored the game-winning goal in overtime to lead Half Hollow Hills East an 11-10 win over Smithtown West in the Suffolk A semifinals. Drew Martin had the assist on the game-winner. 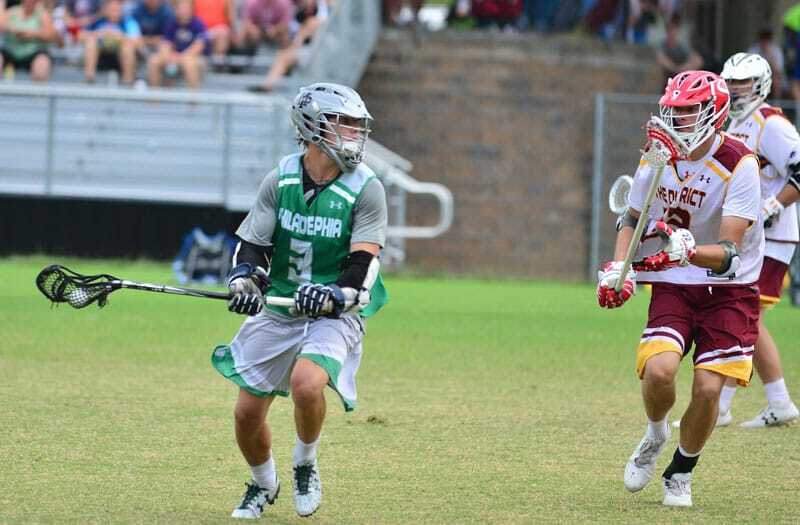 Schelling totaled six points as Delbarton defeated St. Augustine Prep (N.J.) 14-5 in the semifinals of the Non-Public A tournament last week. The senior has 50 points this season.